This was one of my earliest photos that I printed myself. 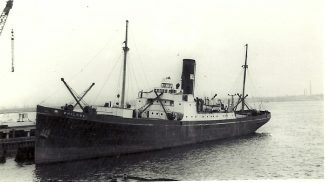 The PHILOMEL belonged to the General Steam Navigation and was built in 1928. The photo at Wards Shipbreakers at Grays in about 1961. The General Steam Navigation Co Ltd general cargo steamer PHILOMEL arrived at Ward’s yard on 25 May 1961. I can confirm, JW, that you took this photo in the same year because the BP tanker BRITISH DIPLOMAT arrived at that jetty and occupied the mudbank on the other side from 22 December 1961. The tanker was of such size that it would certainly have been visible in this photograph if taken after 22 December. And, according to notes that I made in the later 1960s, much of the upperworks of PHILOMEL had gone by early autumn 1961. I sailed in this vessel as 3rd mate in early 1961 probly on one of her last voyages. Being a triple expansion steam engined vessel she was very quiet at sea but noisy in port with sream deck machinery. Found the following info (internet under GSNC) originally named GRONINGEN launched 1928, registered tonnage 1202, renamed PHILOMEL 1958 scrapped 1961.